You may not know UK distributor Illuminations, and if not you ought to get to know them. They specialise in DVDs that focus on art and artists and more experimental cinema and have rather splendid catalogue that includes Chris Petit's Unrequited Love and the Maysles brothers' fabulous The Gates. You can buy discs directly from their web site at http://www.illuminationsmedia.co.uk, where you'll also find a very worthwile blog by John Wyver. No Illuminations, incollaboration with Act Productions, have announced an exclusive DVD of the sell-out stage play Being Shakespeare starring Simon Callow. Released to coincide with Simon Callow's return to London's Trafalgar Studios in March to reprise his stage role, the DVD features a virtuoso performance that weaves together extracts from Shakespeare's most famous plays and poems, breathing new life into his unforgettable characters. Written by renowned Shakespeare scholar, Jonathan Bate, and taking its cue from Jacques' famous ‘Seven Ages of Man' speech in As You Like It, Simon Callow presents a vivid and very human portrait of the real man behind the Elizabethan legend. Recorded for Sky Arts during the play's triumphant 2011 London West End run, directed by Tom Cairns and produced by ATG and Act Productions,Being Shakespeare is both a wonderful introduction to the Bard and a funny, moving, and fascinating study for those who already love his plays. Being Shakespeare will be broadcast as part of Sky Arts' Shakespeare season, which begins on April 15th. 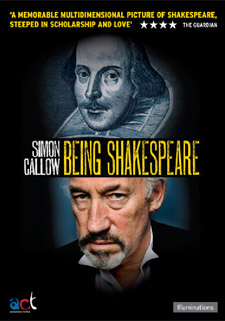 Being Shakespeare will be released on UK DVD on 8th March 2012 by Illuminations at the RRP of £14.99. The DVD will also include an exclusive interview with Simon Callow and performances of his personal selection of Shakespeare's Sonnets, including the famous Sonnet 18.